been opened up by Cisco with an IETF draft. 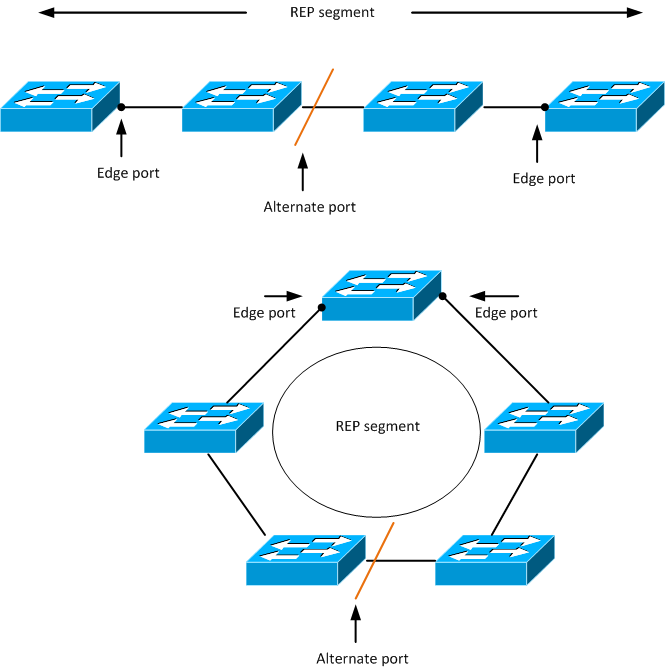 EIGRP has been accused of having no hierarchy. 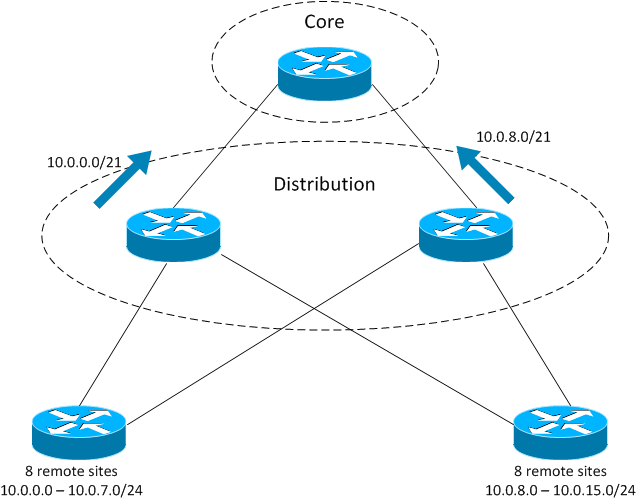 make EIGRP behave and scale in the best way. Future posts will look at OSPF and ISIS. 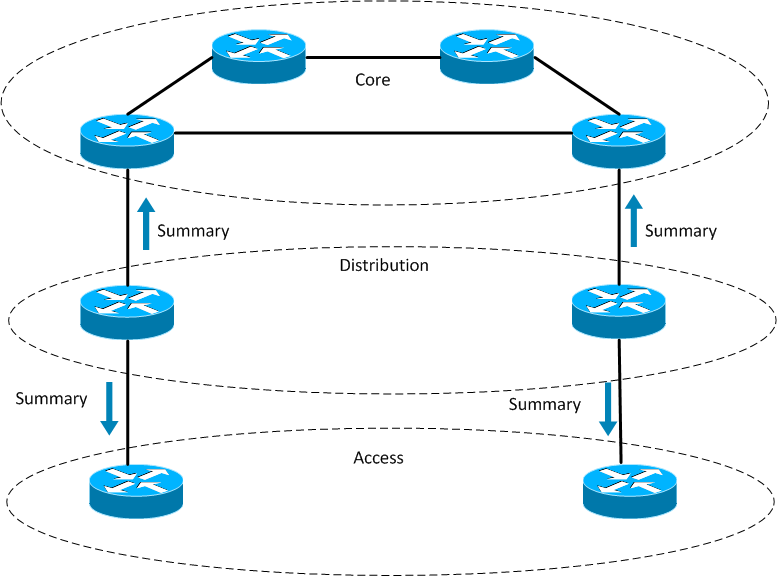 to achieve hierarchy with EIGRP and this is done through summarization and/or filtering. way EIGRP can have more “levels” than OSPF or ISIS. there are loop free alternate paths, these are called feasible successors. 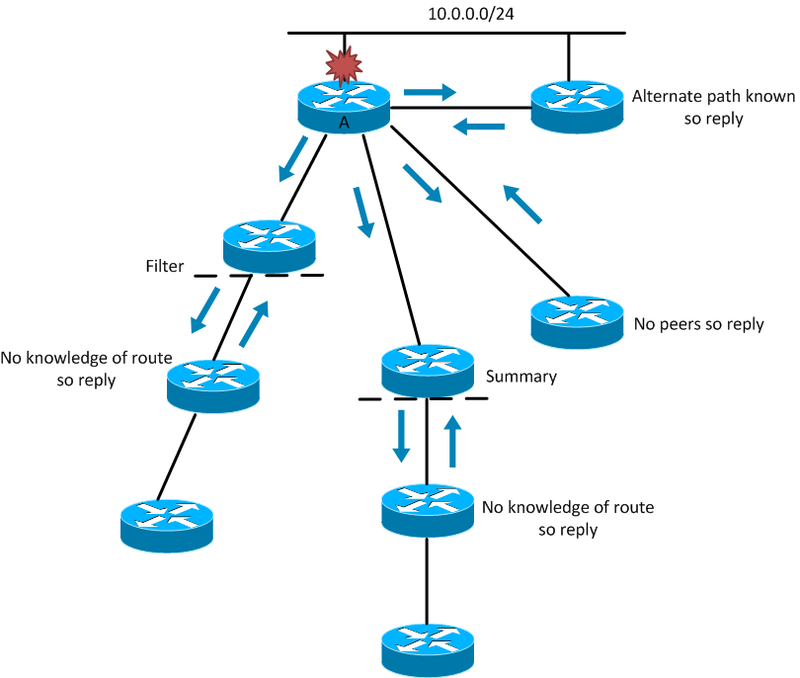 entire network unless consideration has been taken to bound the query scope. manner that it’s easy to summarize from the distribution layer towards the core. something that makes it easy to summarize. Where should the filtering/summarization be applied? It depends on the network topology. When using only two layers summarize from the Aggregation layer towards the Core. 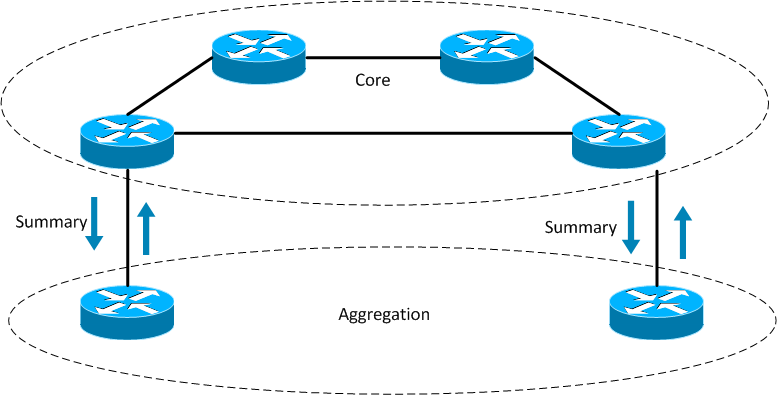 on the Aggregation router then filter on the Core edge routers. both with bounding queries and speeding up convergence. avoided. Summarization can cause black holes and routing loops if care is not taken. still available in the summary, the summary is still advertised towards the core. If traffic arrives at B destined for 10.0.0.0/24, the traffic will be black holed. core, causing a routing loop. EIGRP has a concept of stub routers, this is not the same as stub routing in OSPF. sent out when the link between A and B fails. 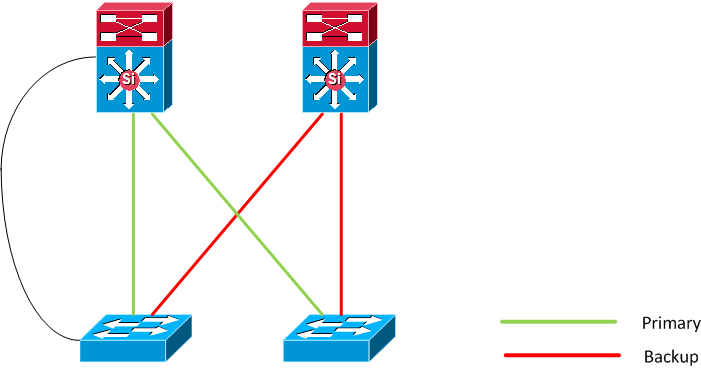 Sometimes there may be dual routers attached to the same LAN as in the following diagram. adjacencies which will slow down convergence and lead to a more unstable network. be bounded and this is done through summarization/filtering and the stub feature. 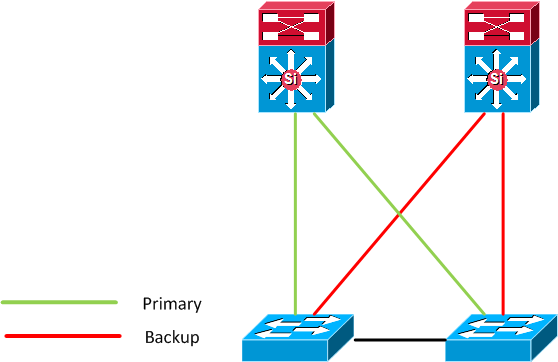 these topologies however and it can also interact with STP if there is a desire to do so. REP is Cisco proprietary, other vendors have similar protocols like EAPS from Extreme Networks. segment ends. 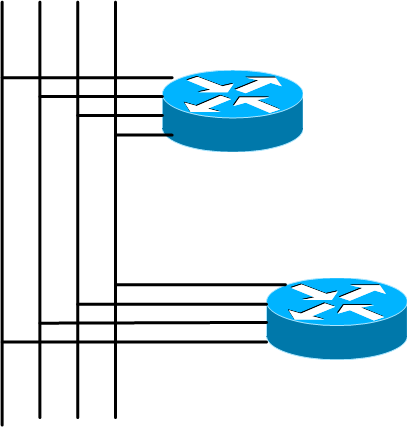 These edge ports must not have connectivity with each other. Traffic flows towards the edge ports. REP ports are either failed, open or alternate. After adjacencies have been determined, ports move to Alternate state. After negotiations on Alternate port is done the remaining ports move to open state while one port stays in Alternate state. When a failure occurs on a link all ports move to failed state. When the Alternate port receives the notification it is moved to open state. that is responsible for this action. ports will be forwarding. The alternate port can also manually be selected if desired. that the interface does not go down but connectivity it lost, REP must rely on timers. not been received from a neighbor. it must flush its L2 MAC table. connected to a PE that runs MPLS/IP to the core. Starting from the edge ports End Port Advertisements (ESA) are sent out every four seconds. to see what the topology looked like before a failure because REP has an archive feature. it will cause a temporary loss of traffic. 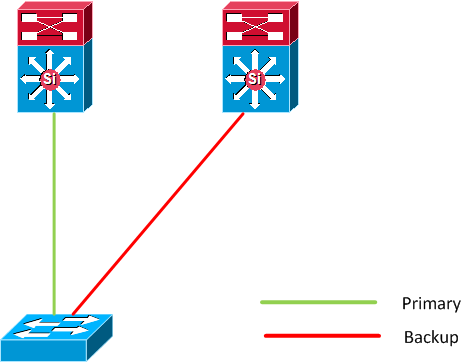 always sent on one VLAN compared to PVST+/RPVST+ which sends BPDUs per VLAN. segment to the other devices which can then use this key to unblock the alternate port. differences. 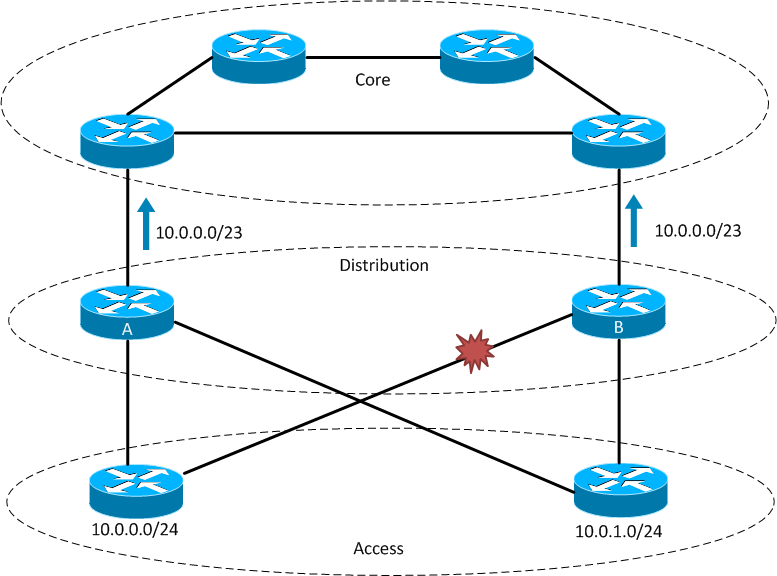 REP is supported on Cisco ME switches.